Thanksgiving is a time to think about all that you are thankful for, but often we just find it to be the kind of holiday that encourages us to start our holiday shopping spree, eating too much food, and spending lots of time with the family- however great or annoying they may be. For the average American though, we all get these pangs of guilt about the kinds of things we could be doing if we just had a few minutes at our desks. Afterall, when Aunt Jessie repeats the same cranberry recipe for the umpteenth time, it’s really not going to help you in any way – especially because there’s nothing that great about cranberries anyways. So for this Thanksgiving, we’re incredibly thankful for our awesome users and want to help you navigate your way to making the most of your mobile so that you can still get a 5-minute escape whenever you need a sanity break (or a few, all depending on your small talk threshold). As we all know, there are cloud apps that are easy to use on mobile, and some that we only want to use if there is a gun lying around so that we can dull the pain of our own frustration. Don’t get us wrong, all cloud apps are great and all offer something unique, but there are really only a few that are developed for a smooth mobile experience. The original note-taking app that morphed somewhere along the line to the everything app. Google Drive: Great for free storage: video, pics, anything. Handy tip: This is also great to use if you’re synching Sharepoint with Dropbox because Sharepoint has no mobile app; but you can still access it on your mobile if you sync it with Dropbox. Heck, yes. This app is the “everything CRM” package, and did someone at the table just say that they need your product/service? Just upload their info as an account in the Salesforce app, and you’re golden. Now that you know which top 4 apps are awesome on mobile, go ahead and sync the ones that aren’t as awesome on mobile to the ones that are, and you’ll be able to work from your fave mobile apps, while your work will automatically appear in those other cloud services that aren’t so mobile friendly. With that, our entire team is thankful for your support. 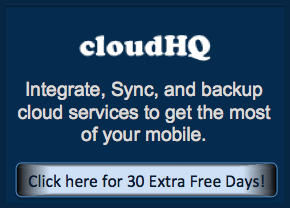 Here’s an extra 30 days of free Premium Plan service for being the awesome folks that you are.